Ephraim Tabornal DDS, Allison Tran DDS, Island in the Hills Dentistry, Inc.
Drs. 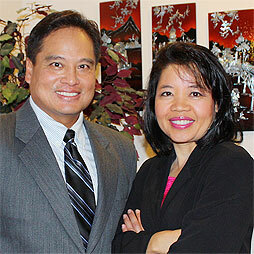 Ephraim J. Tabornal and Allison P. Tran would like to welcome you to our office. We are a practice dedicated to family and cosmetic dentistry, located in “America’s Finest City”, San Diego, California. We have been practicing the art of dentistry since 1992 and our motto since day one has been “Personalized dental care with a gentle touch for all ages.” Our dedicated professional team listens attentively to your concerns and needs. We continually stay abreast in the latest in dental procedures and technology. Our objective is to provide individualized care at its highest standards comfortably and efficiently. Feel free to call us, we would be happy to serve you and your family. Serving San Diego since 1992.